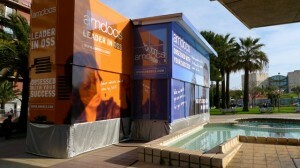 Amdocs marketing took a different approach to TMW this year with a minimalist presence on the expo show floor. In fact, Amdocs had no stand in the expo, and no meeting rooms inside the Acropolis. Instead Amdocs returned with the big lorry they had last years, parked just around the corner by the fountains. This beast changed, Transformers style, in to a pretty neat mini-conference-centre. Presumably it offers a bit more value-for-money than a typical TMW package, while also allowing Amdocs to customize the space a little more. Inside, it’s pleasant enough. Downstairs had space to mingle or host presentations, a couple of comfy chairs and a little coffee bar. Upstairs, I believe, was meeting room space. Inside the Acropolis, prominent posters advertised their solutions and directed punters to the action outside. Amdocs has announced they have integrated their Enterprise Product Catalog (EPC) with the new Service Composition Manager (SCM). EPC is a relatively new, generic, product catalog from Amdocs. SCM is the result of cross-breeding previous service composition products from Amdocs and Cramer, namely Cramer Service Catalog and Amdocs Service Manager. While EPC is principally aimed at building bespoke product catalogs its generic nature has meant that it can be used to offer a unified front-end to allow commercial products to be specified along with the technical service and resource specification. Not news as such, but Amdocs have grabbed some extra column-inches with their timely publication of a survey on OSS outsourcing. a. An opportunity for business growth through new revenue models? b. A defensive play to avoid outsourcers undercutting ‘expensive’ license + service revenue models? c. A PR exercise that will come to nothing in the long term as most telcos will never get their house in order enough to support outsourcing of technical functions? I haven’t made my mind up yet. 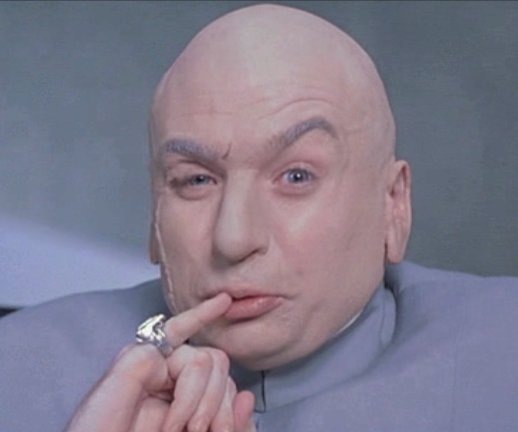 Last week Amdocs blogged on the catchy subject of tera-play: Being ready for one trillion devices being connected to the world’s networks. I like it. Really focuses the mind. And as an OSS architect and technology geek, it gets me thinking about scalability, modeling, processes and such like. But, back to Amdocs’ take on the topic. They’ve got a bunch of brief videos covering different issues to do with this, and each one is tera-something. Some sound scary, like tera-psycology. Or there’s tera-digm. ‘It’s a new paradigm for service providers doing business in an era of a trillion connected devices’. Teradigm. Teradigm?